Iran? Number 1! Russia? Number 1! USA? Hacktui! Gene Mean, look at our body. Cameraman, zoom! Happy 76th birthday to one of the greatest WWF villains of the ’80s, The Iron Sheik!!! 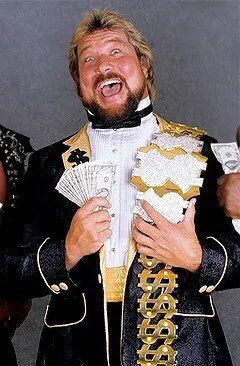 Happy 64th birthday to “The Million Dollar Man” Ted DiBiase!!! Question: What movie featured Stephen King’s son, Joe, as a boy who is punished by his father for reading horror comics? Last Question: What stage name was legendary WWF announcer Robert Marella better known by? Gorilla Monsoon began wrestling for the WWWF/WWF in the early ’60s until the early ’80s. In the early ’80s, Vincent J. McMahon’s son, current WWE CEO Vincent K. McMahon, began assuming the reins of the promotion from his father. The elder McMahon asked his son to take care of long-time employees that had been loyal to him. The younger McMahon agreed, and in 1982, Vince bought Monsoon’s shares in the company in exchange for a guarantee of lifetime employment. Then McMahon needed a new commentary team to head up his television programming. So he had Gorilla Monsoon do it alongside the recently retired Jesse “The Body” Ventura. The two announcers had incredible chemistry and set the standard for years to come. Monsoon would by the pro-good guy “voice of reason” and Jesse would be pro-bad guy. When Ventura left the WWF in 1990, Monsoon was paired with villainous manager Bobby “The Brain” Heenan, another duo that subsequent wrestling commentary teams have often tried to emulate. The two also formed a real-life friendship which Heenan often recalls fondly. Monsoon stepped down as the WWF’s lead commentator at WrestleMania IX to make way for WCW recruit Jim Ross. In 1995, there was a storyline with Monsoon as the president of the WWF, in which he had to settle disputes between wrestlers and make matches. But by 1997, his health began to deteriorate, so the position was retired, and Sgt. Slaughter was named the new WWF Commissioner in August of that year.